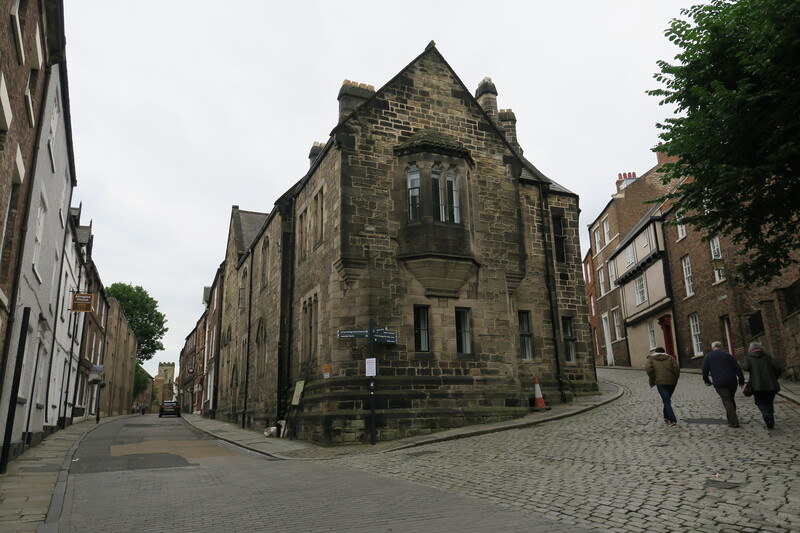 A short drive from our hotel and we were in the small and very beautiful city of Durham. We didn’t have too much on the agenda for this visit, see the cathedral and just wander a bit was my plan. 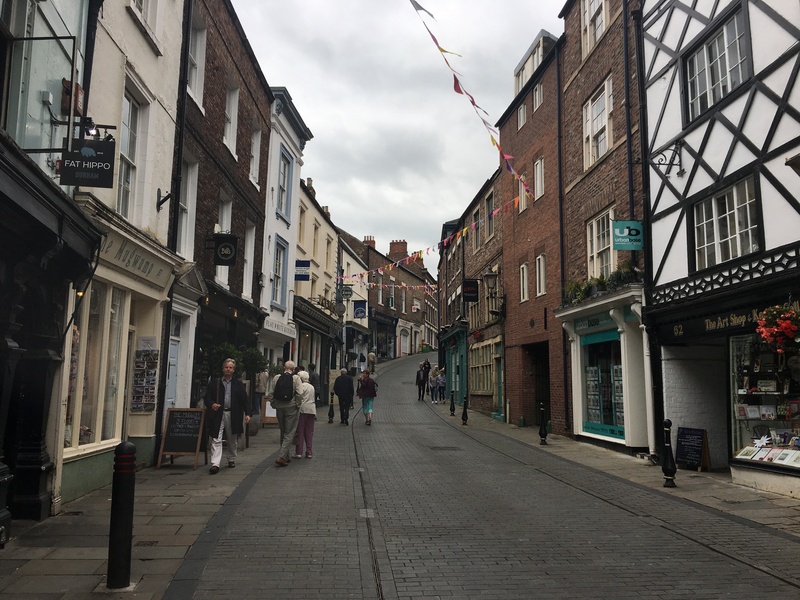 This place is made for that – lovely old cobbled streets, a city that is not too big but big enough, UNESCO historic buildings, loads of students with a buzzing and vibrant atmosphere plus it is just a delight to explore on foot. All paths seem to lead to the cathedral. We crossed the river and headed up to this incredible 1,000 year old building. An interesting story about how it came to be. St Cuthbert, the Saxon religious leader was buried on Lindisfarne in the late 7th century. His body was dug up 200 years later when the Vikings arrived, reburied and eventually was being brought back to its original burial place, the story goes that Cuthbert’s bones rebelled and refused to budge. The monks buried him on that spot and then built a cathedral over him. 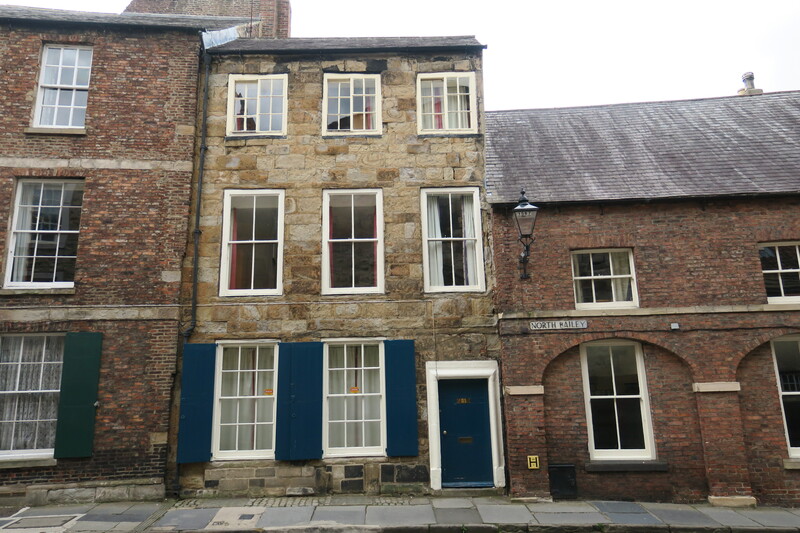 Hence the city of Durham began…. Palace Green, full of lovely Georgian buildings, the castle and almshouses is the perfect place to stand for a moment and ponder on the beauty and history of this place. Son spied a little cafe – Cafe on the Green – and persuaded us to step inside. Great coffee and cakes meant we were refreshed and restored for our cathedral explorations. The cathedral is awe inspiring. A Norman building, it sits high above the river and the whole city seems almost to huddle at its feet. This is a must see in Durham. We booked on one of the guided tours of the cathedral and also bought tickets for the Open Treasure Exhibition. We did that first. Unfortunately you aren’t allowed to take any pictures inside the cathedral or the exhibition but take it from me, the interior is spectacular. Over £10 million has been invested in the Open Treasure Exhibition with the centre piece being the vast 14th century monks’ dormitory with its incredible original oak beamed ceiling. This was once divided into cubicles where the monks would sleep and study, now it houses the exhibition. 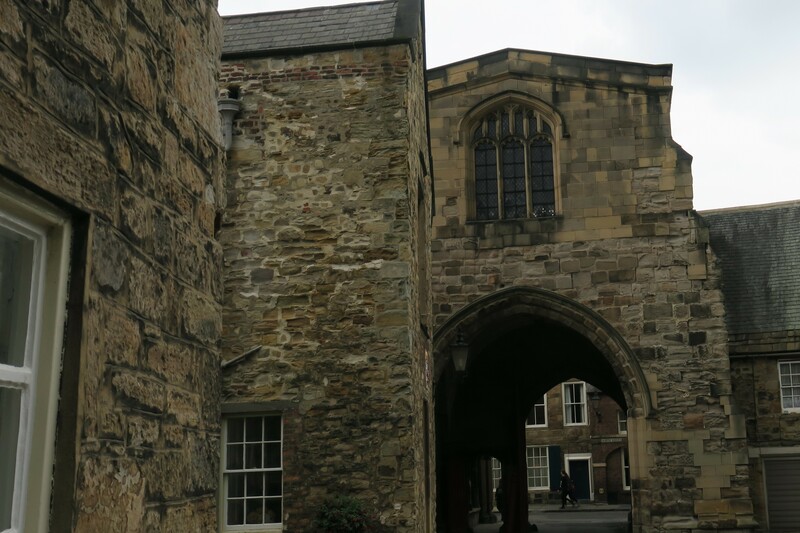 All about Christian history and culture in the north east of England, there are lots of artefacts and burial stones and crosses, some dating from the 3rd century. Son, Husband and I mooched around on our own, each focusing on the parts that interested us most. For me the best part of the visit was being able to be inside and explore previously inaccessible parts of the cathedral. Son enjoyed learning about the life of a monk and of course threw himself into the whole experience by dressing up. He even managed to persuade Husband to get involved. Photos are allowed in this one little area so I was able to capture this moment. Once this place housed dozens of cubicles where the monks slept and studied. There are a number of interactive exhibits which Son enjoyed as they brought the whole thing to life. I don’t think he would have been much good at the monk’s life – rising at 6am, existing on fish and bread but most of all spending much of the day in strict silence just wouldn’t work too well for him. Through special air lock doors they have the Magna Carta exhibition. All three issues of Durham’s Magna Carta are on display here including the only surviving copy of the 1216 issue and further issues from 1225 and 1300. The dates of these papers are mind blowing, Son though was not overly impressed but did actually read the information boards and found an error with one of the dates. The guide congratulated him and gave him a bag of sweets. I was just impressed he was reading and taking something in. We had a look at the very intricate Lego model of the cathedral in the Undercroft, browsed the gift shop and strolled through the incredible cloisters. Back again to the main entrance after all that as it was time for our guided tour of the cathedral. Quite a few people on the tour but our guide was excellent and very easy to hear. He told us about the history of this great church and pointed out all things of interest. We heard about the roof arches, the first in England and a great architectural achievement of the time. Highlights were the tomb of St Cuthbert and the grave of the Venerable Bede, the 8th century monk who, amongst other things introduced the numbering of years from the birth of Jesus. The tour lasted about 1.5 hours but the time flew past. Son was mainly interested, he zoned in and out a bit but some things did stick. Husband and I thoroughly enjoyed it all and left feeling so much more informed about this incredible building. Your son is now taller than you! When I first followed your blog, I remember he was still little (not so little but definitely shorter than you!). So where exactly in England is Durham? Sorry if I missed that part (just in case you wrote it in this post). Take care! 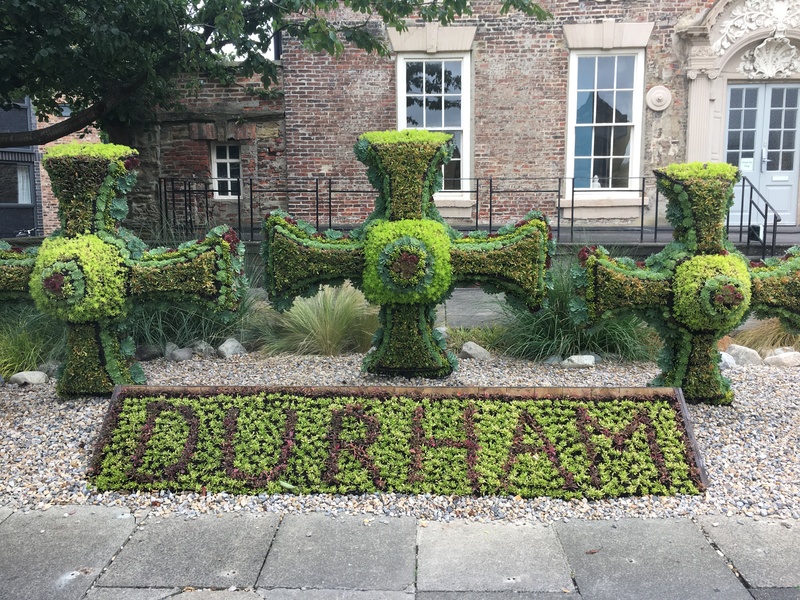 Durham is up in the north east of England – near the top!! It is so strange that he is quite a bit taller than me now, seems to have happened all of a sudden this summer. When we look back on pictures even from Christmas time he has grown so much. You’ve been through all this already!! I bought one of those Lego bricks when I was there a couple of years ago. So you own a little part of the cathedral or helped to pay for this new exhibition – have you been back to see it? Never been back to Durham, I put it into the ‘once is enough’ category. I liked it well enough but there are too many other places to visit. You’re right – far too many other ones!! We had been years ago when our son was little but went back to the area mainly to see Kynren and squeezed in a morning in Durham. Have you seen it? No, haven’t seen that but wish I had! I’ve only visited Durham briefly a long time ago on our way back from Scotland but I’d definitely like to return. Younger son considered Durham University but preferred Edinburgh so I just whizzed through Durham on the train to visit him! Have been shopping in Manchester today and got soaked ! I love Edinburgh so not a bad place at all to study (or visit him!!). 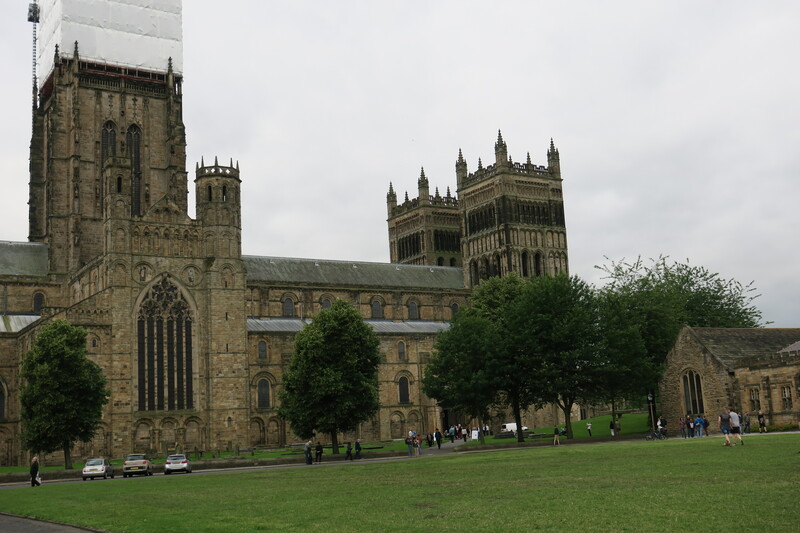 Durham is interesting and we had a lovely day there despite the gloomy weather, the tour of the cathedral and the exhibition was so interesting. Hope you had a nice time shopping Marion – shame about those showers though!! They sold each Lego brick to raise money for their new exhibition – such a great idea I think. We loved the Lego model too, I’m sure your son would have been intrigued, it is so detailed and well done. Absolutely George, these ones could tell some tales for sure!! Sounds like another great adventure and it’s amazing how your son has grown into a young man during the time I’ve been following your blog. Continue to enjoy as time goes so quickly. He seems to keep sprouting up like a weed over this summer! It’s strange to look back even 6 months ago and see how he has changed. He turned 14 last weekend, I can hardly believe how fast those years have gone by. The guided tour was great and a fun way to learn about its history and stories. I’ve never been to Durham – only ever passed through on the train when visiting a friend in Newcastle. Looks like it merits a little detour when I’m next up in that area! When I was at home briefly this summer, I noticed Chester Cathedral was building a Lego model – certainly puts the “fun” into “fundraising”! That’s interesting to know – we’ll have to go to Chester and check that out, thanks for the info Rosie. We were in Chester over the summer and planned to visit the cathedral but there was a funeral on so it was closed. A day trip there looms I think! I’ll have to pay a trip there myself when I’m next home to see the finished article. How unfortunate that it was closed the one day you were there – hopefully next time that isn’t the case! I grew up near Durham and it has never been surpassed as my favourite cathedral ever. I’m not sure I knew that about Bede numbering the years though. I loved the cathedral and our guided tour – the guide really made it for us, he was full of interesting tales and stories and brought the history of this great building alive. I don’t know what is happening with our son, he seems to keep growing and growing, left it to the very last minute for school shoes and uniform thanks to how much he has changed just this summer! That’s a shame about your brother Rosemary but I know exactly what you mean. A bad experience definitely affects how you remember a place. 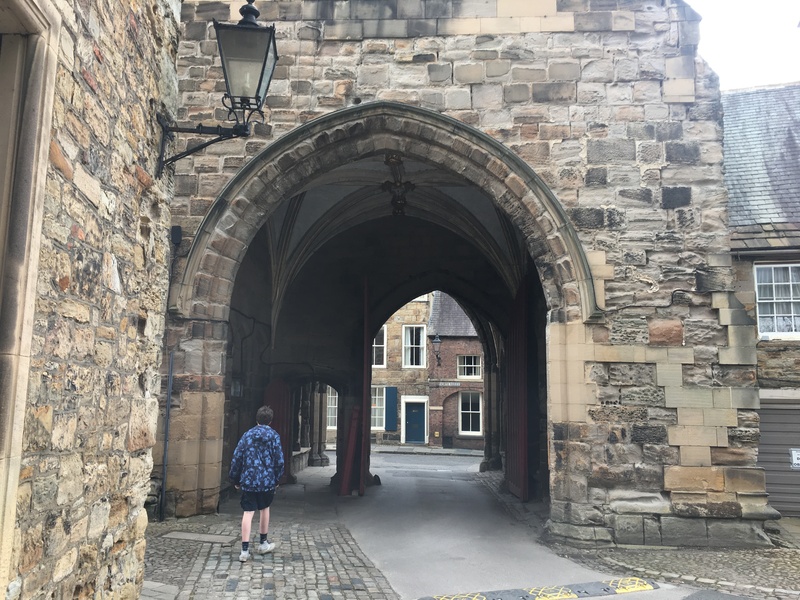 We really enjoyed exploring and mooching around even though the weather wasn’t all that great – we didn’t really have time to explore enough in my opinion!! 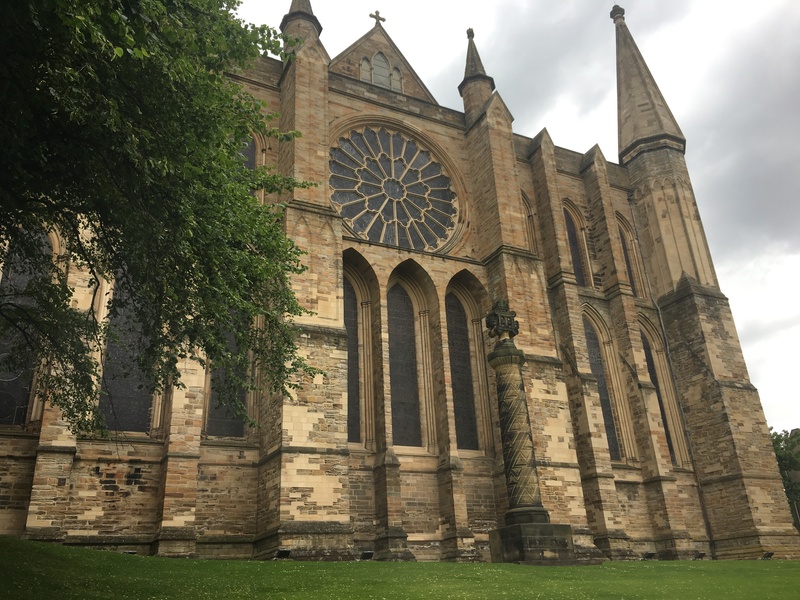 The cathedral is so interesting too, I loved the tour and the exhibition definitely recommend if you ever get to Durham. Back to school on Wednesday, it wasn’t greeted with too much excitement by our son but he did have a good couple of days although getting back into the swing of doing homework – that’s another story!!! Hope you are enjoying your weekend too. It’s quite nice though isn’t it Rosemary to be involved in the school run and the whole school experience. The only thing I noticed is that since our son started school the time zooms past even more quickly than normal once everything starts to revolve around school terms. Yes I find time zooming by anyway these days Joy! I used to work in education and then went straight to grandparent duties plus my daughter is a teacher so I still run my year round school terms. Next year I’l be even more closely involved again – round 2 of school runs with the next generation! I went to university in Durham and your post brought back lots of very fond memories. The cathedral is spectacular and even after three years there, I’d stare in awe at the cathedral whenever I passed it. The walk along the river below the cathedral is also beautiful and one of my favourite walks. 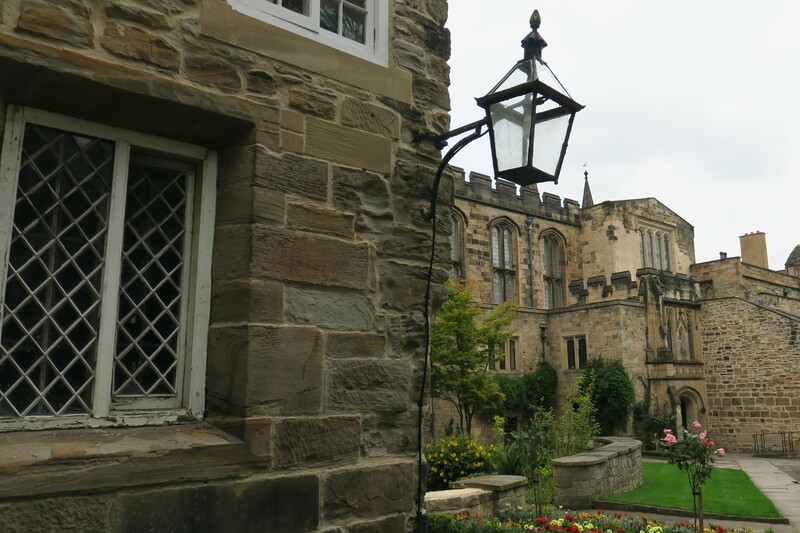 Studying in Durham must have been a wonderful experience, such a gorgeous city. 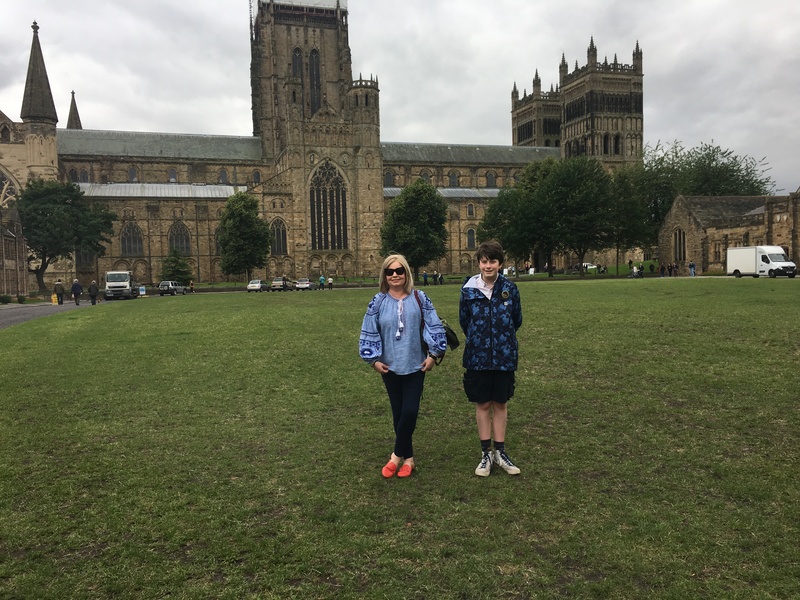 We loved our tour of the cathedral, I really wanted to do the river walk but we ran out of time – we’ll have to go back! It was, it was a great city in which to study. I felt very lucky to be there. Reading your post reminds me, it’s about time I went back and revisited it. 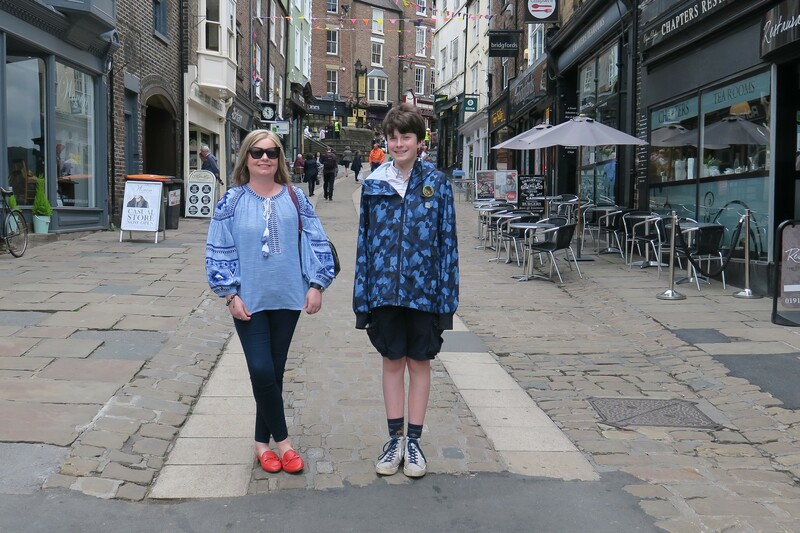 If you get a chance to do the river walk some time, you should – it was my favourite thing to do in Durham. Haven’t been since I was a child, but I can remember being struck by the spectacular location of Durham Cathedral on the hill above the river. It really is the perfect location for such an impressive cathedral. Sounds like quite a unique and fun experience with the whole dressing up like monks and the interactive exhibits on the life of a monk. A cathedral we’d love to visit for sure! The dressing up was a lot of fun and the rest of the exhibition was really interesting too. The history of this place is incredible, if you ever get a chance to visit I definitely recommend!! I’ve never stopped in Durham, but the cathedral looks well worth a visit. The streets look very charming as well! We only had a few hours there but I would have liked to explore more, the river walk is supposed to be lovely and the streets are beautiful and packed with interesting cafes and bars. 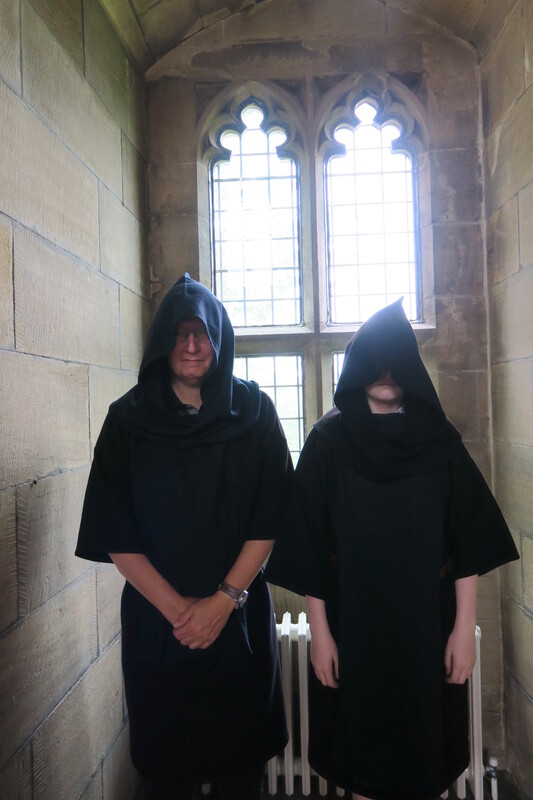 We did enjoy the cathedral as well – definitely worth a visit if you are in the area. Joy, cathedrals are always of interest to me. It looks like a real treasure to see and explore! It really was Pam, beautiful inside and out and with so much interesting history and so many tales from down the years.